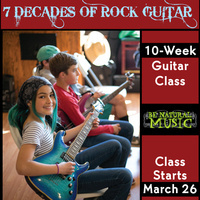 Students will learn to play legendary guitar passages by rock icons like Chuck Berry, Eric Clapton, Jimi Hendrix, Led Zeppelin’s Jimmy Page, Deep Purple’s Richie Blackmore, Pink Floyd’s David Gilmour, and Queen’s Brian May. The course includes insights on the history & evolution of rock music, as well as how the featured players got their signature sounds. LEVEL OF EXPERIENCE REQUIRED: Students must be able to read guitar tablature and be comfortable with key techniques of playing such as note bends, string slides, muting, and major and minor Barre chords.